Princes’ Islands (Turkish: Prens Adaları, also İstanbul Adaları, Kızıl Adalar or Adalar; “Islands of Istanbul”, “Red Islands”, and “Islands” respectively) are a group of nine islands off the Asian coast of Istanbul, Turkey. Their name is sometimes incorrectly spelled as “Prince’s Islands” or “Princess’ Islands." Princes’ Islands take their name from the fact that during Byzantine and early Ottoman period, members of dynasties who fell out of favor were sent to exile there. Until late 19th century, when regular steamer transportation showed up in the seas around Istanbul, these islands were considered remote and far-away places. Apart from the exiled princes, only a handful of monks found these islands inhabitable then, a fact which gives the islands their former name in Turkish: Keşiş Adaları (“Islands of the Monks”). Princes’ Islands consist of four major and five minor islands. Major ones are as follows (from west to east, also from smallest to biggest): Kınalıada, Burgaz, Heybeliada, and Büyükada. Apart from these, only one more island of the archipelago is inhabited, that is Sedef which lies east of Büyükada. The other, unhabited ones are: Tavşan south of Büyükada, Kaşık (between Burgaz and Heybeliada), Yassıada and Sivriada (both lying further away in the sea, southwest of Kınalıada). This article will focus on the four major ones, as public transport to uninhabited islands is virtually non-existent, and much of Sedef is private property with limited access. The islands are an interesting anomaly because they allow for a very rare, albeit incomplete, insight into a multicultural society in modern Turkey, possibly alike to the multicultural society that once existed during the Ottoman Empire in places such as nearby Istanbul/Constantinople. Prior to 1950s, each of the inhabited islands had significant communities of ethnic minorities of Turkey, which still is the case to a much smaller extent. Since the vast majority of the residents and visitors are Turkish, today their legacy is of cultural rather than of demographic importance: Kınalıada (Greek: Proti) used to be the summer retreat of the Armenian archbishop and the Armenian community of Istanbul, Burgazada (Greek: Antigoni) used to be a sleepy village inhabited by Greek fishermen. Heybeliada (Greek: Halki) was the main Turkish settlement on the Princes' Islands, while Büyükada (Greek: Prinkipos) was mostly favored by local Jews and foreign residents of Istanbul, mostly of European descent, although all of these ethnicities could be encountered on Büyükada. This is partially responsible for the different characters of the islands that lie so close to each other. These islands prove to be a good day-trip especially when you are bored of the crowd, noise, and traffic of Istanbul. Quite a shock is what many travellers experience upon their return to the city, when full-blast car horns are still the way how they were when left behind early in the morning. One of the best times to be on the islands is during spring (April-May) and during autumn (September-October). During these seasons, the air is neither that cold nor hot, the islands are not very crowded and during spring (especially in late March), the mimosa trees, which are some sort of symbol of the islands, are in full bloom of their yellow flowers. At weekends during summer (June-August), all of the islands are really crowded, and so are the ships. Avoid if you can. During winter, the exact opposite is the case. However, if you want to enjoy the islands blanketed by snow and/or a very gloomy and almost deserted “ghost-town” experience and don’t mind the biting cold, then winter is definitely that season. 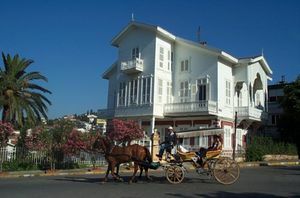 If you don’t have time to visit all of the islands, pick Büyükada: it’s undoubtedly the “queen” of the islands. Upon getting off the ferry, you’ll recognize the clock at the square just a block up in front of you. 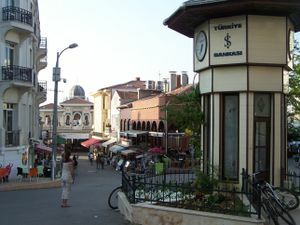 This is the main square of Büyükada, and around it is the town centre. Most grocery stores are to your left, as well as the restaurants which also occupy the waterfront to your left when exiting the quay. From the clock, major roads of the island diverge left (east), right (west), and straight ahead (south) among some mansions (best of which are lined on the main road to right) towards the hill, as well as narrower streets and alleys connecting these. These roads join each other again in Birlik Meydanı Square (lit. "union square", perhaps because the roads "unite" there), the geographical centre point of the island, lying amongst pine woods between the two main hilltops. From that square, whether you take the road to left or right, you will end up in the same square, as that road encircles the southern half of the island, at a distance to the sea. The Church of St George lies at the end of another cobbled uphill path starting from Birlik Meydanı. There is a large and detailed map of the island posted at the left of exit of ferry quay. The only way to get to islands is by sea: whether Istanbul liners or fast ferries , available at various hours every day. From European Side of Istanbul, you can take a boat from Kabataş, while from Asian Side, the piers with a connection to the islands are located in Kadıköy, Bostancı, Maltepe and Kartal. 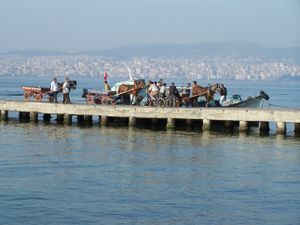 The most frequent departures are from Bostancı (especially in winter), which also has private mid-sized boat connection to the islands in addition to liners and fast ferries. See Asian Side article for an extensive detail of how to get to Bostancı from more central parts of the city. A trip on liners typically take around an hour and a half from European Side, and 45 minutes from Asian Side. Almost all ferries call at all four major islands in a row, but sometimes they first call at Büyükada, and other times at Kınalıada. Island names are not announced by voice inside the ships, so be sure to check the large signs on the quays to make sure that the island you are about to step on is the one that you want to step on. 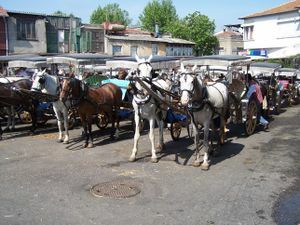 As the motorized vehicles (save for service vehicles like school buses or ambulances) are all banned on the islands, the most popular way of getting around is horse-drawn carriages (fayton), which can be likened to taxis, or the dolmuş, of the mainland. There is a fixed price for every location (in Büyükada, they are announced on the sign in the main fayton stop near the quay). The greatest price is for a total loop (known as Büyük Tur) around the island (length: about 15 km, price: about YTL 80 for the long route (1 hr) and 70 YTL for the short loop (45 minutes) in March 2015). Price is per fayton, i.e. not dependent on how much people the fayton carries (but they accept no more than 4, and some horses are not very comfortable with more than 3 passengers). Please note that there are no faytons in Kınalıada, as that island is not big enough to justify taking one. Many of the horses have very bad living and working conditions and can be sick or lame. Be sure to check the condition of the animals before boarding a fayton. Renting a bike is another alternative. The fare is YTL 5.00 per hour (April, 2013). Most renters require you to leave an official identification to be returned after the payment is made. A student ID may suffice. Some renters distribute a road map of the island free of charge, don’t forget to ask for it. Walking the pleasant streets of the islands is obviously an alternative, too. All boats operating between the islands and the mainland call at all of the major islands, so you can also take them for island-hopping. Hagios Giorgios Church (Saint George/Aya Yorgi) is located on one of two summits of Büyükada. After reaching the central point of the island (known as Birlik Meydanı Square), you should climb a steep cobblestoned path on foot to get there (it’s too steep for a fayton, as well as a bike, to climb). It takes about 35-40 minutes. Although the church building itself is unexceptional with nothing really fascinating, the backyard of the church offers some very beautiful sights of the other islands and the sea. On April 23rd every year, which is St George’s holy day, a crowd of seemingly tens of thousands attend the church to make wishes. Wishmaking rituals that day range from usual burning a candle to climbing the cobbled path on bare feet to untying wool balls all along the path. The final part of the path that day is as crowded as a rock concert (except very early in the morning, like 6AM, it’s reported), because police officers let people in in groups of 10-15 at once, to avoid an overcrowding inside the church. If you decide to burn a candle that day keep in mind that nearer the church you are, cheaper the candles being sold around (for example, in 2007 it was YTL 2.00 near the quay, while the going price very near the church was YTL 0.50 per candle). But better of all would be to buy the candle inside the church for a donation (it’s up to you how much to pay) as none of the profit of the candles sold on the streets benefits the church. And a sidenote: Most of the people attending the church and waiting for a blessing from the priest upon exit that day are non-Christian Turks, but there is nothing surprising about that: This is Turkey, where east meets west (and vice versa) and cultures truly mix. Sotiros Christou Church is situated on Isa Hill of Buyukada. The church dates back from the Byzantine era and today only the south wing of the building still exists, as well as a few outdoor buildings. On the other summit of Büyükada, amidst the pine woods lies the abandoned and dilapidated Greek Orphanage (Rum Yetimhanesi), looking like a haunted manor. Originally built as a hotel in late 19th century, this completely-wooden, 4-story building is the second largest wooden construction in whole world (the largest in Europe). It’s dangerous to enter the building itself (because it’s slowly decaying), and also forbidden. 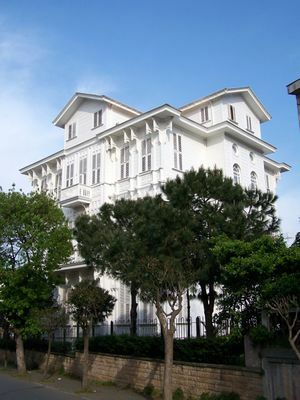 Both the eastern and western side of Büyükada is full of wooden Victorian-style mansions dating back to late 19th/early 20th century, similars of which have been bulldozed in the rest of Istanbul (with the exception of neighborhoods on Bosphorus banks) to make way for concrete, multi-story apartment buildings. The ones on the western side (right side when looking out of quay) seem more splendid. Just don’t be surprised and don’t start looking for them as soon as you get off the ship: Around the quay is more like a modest town centre. They are located about 15 min walk away from the quay. Great/Total Circuit (Büyük Tur, about 15 km in Büyükada): Either by fayton or bike. It’s not as hard as it may sound, except a few slopes. Have a picnic in a scenic spot. Kınalıada is the best option for taking a beach day and swim. Büyükada and Heybeliada both have a limited range of hotels, some of which serve in a boutique style, preferred by many tourists but not spectacularly clean. Splendid Palace Hotel, 23 Nisan Cad. no: 53, Büyükada, ☎ +90 216 382-67-75 ([email protected]), . Located in an Art-Nouveau building which dates back to 1908. edit Described in NY Times article here . As an old building it has character but few mod con's - don't expect air conditioning or double glazing. If you are doing the great circuit of Büyükada, beware of dogs near the cemetery, which suddenly start barking at and chasing you when you are about to re-enter the built-up area in the east of the island if you are circumambulating the island counter-clockwise (or after you have just entered the wooded section if you are doing clockwise). The best reaction is to speed up as much as your legs and the bicycle can endure, they give up after a certain length of chase. This warning is especially true for winter. Also, whether you are a pedestrian or a cyclist, always give way to faytons to avoid dangerous collisions. Don’t be fooled by the absence of motorized vehicles: Always check the road first when crossing. The horses can and do have real high speeds. The telephone code for islands is (+90) 216, which is same with the Asian Side but different from European Side. If you are not going to stay overnight in the islands, don’t forget to take a note of departure times of ships back to the city before leaving the quay building. Ships are less frequent after the night falls, especially in winter. Generally the most frequent line (and the one with the latest departure) is Islands-Bostancı one. From Bostancı, you can take dolmuş or public bus (#112) to Taksim in European Side. (once in Bostancı quay, cross the street, walk straight ahead, cross the pedestrian passage under the railway, climb up the second stairs on the left. You’ll come across a little square, on the opposite edge of it is where dolmuşes and buses to Taksim depart). Note that the sea can be rough in spring, autumn and winter, and the islands are sometimes cut off from the outside world when the ferry services are cancelled due to storms and high waves. This page was last edited on 27 March 2019, at 00:57.